Olympic's broad line of oval studio kilns were designed to meet the needs of any studio or classroom where large-scale work is being produced. The 'stretched-out' design has become Olympic's signature shape, and has been a staple in art centers, universities, and more since its introduction in the 70's. So what makes an oval kiln a good choice for your studio? While these kilns don't take up much more room than your standard round kiln, the additional interior space that is created by the oval shape will contribute to your studio's capabilities, output, and efficiency -- you can really fit a LOT of work in these kilns! Likewise, the shape makes it easier to fire large works and small, shelved works in the same firing. In round kilns, larger pieces sometimes hold a monopoly on the available vertical space, but the width of an oval kiln will leave you with enough room to spare that you can often fit in a full stack on at least one side of the kiln! Like all Olympic kilns, this line of oval kilns are constructed of three-inch brick for added insulation and strength. Olympic kilns pride themselves on their efficiency, and this is one way they achieve that! Additionally, each kiln's top section has a 2-inch blank row of bricks to protect the first row of elements. As some of these kilns are rather deep, that's an important feature considering that anyone loading the kiln will be leaning over the edge. Balanced heating elements ensure that heat is evenly distributed inside of each kiln, regardless of the load being fired -- an important consideration when looking for a kiln that may be firing large, irregular work. Each oval kiln lid comes equipt with a lid lift assist, for safe and easy opening and closing of the kiln. Each kiln also features a vent hole in the center of the lid. Most of these oval kilns are assembled in sections, also called rings. Each ring features handles for easy lifting or moving -- and important feature for anyone who may be moving or rearranging their studio -- and the kilns' unique ring locks secure those rings in place so they don't shift once the kiln is in use. 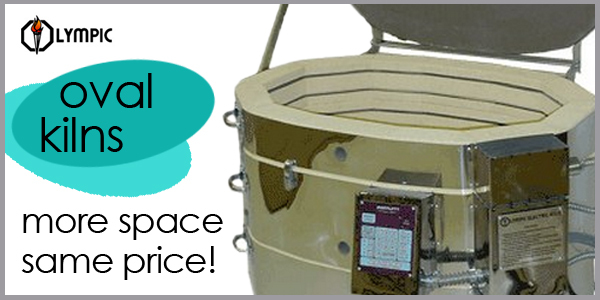 Check out the variety of lengths, widths, and depths below and find the perfect oval kiln for your space!